Bermuda politics has always been pretty intense — partisan, divisive, acrimonious, noisy. And these past few weeks has seen things ramped up to fever pitch with all sorts of accusations, name-calling and finger-pointing — all of it wearing down people’s spirits and deepening public cynicism. With all the noise, the public can be forgiven for thinking that nothing is getting done on their behalf. So I decided to use this space today to assure you that your government is fully engaged in the people’s business, making progress in spite of what you’ve been hearing. This past week alone stands as an example of our work on a lot of levels. Let’s start in the House of Assembly where the Government is moving through the Budget for the coming year — a Budget, by the way, that pays down our national debt, shrinks government spending while protecting people through no new taxes, no lay-offs and continuation of support programmes for people in need. In the past few days, we’ve passed legislation to protect and grow jobs. Tax concessions were extended to the hospitality, restaurant and retail industries, helping maintain operations that keep people working. Tax breaks for employers who hire out-of-work Bermudians were also extended for the coming year. And a tax initiative to encourage the sale of high-end real estate was continued with a view to encouraging sales that lead to jobs for construction workers and the businesses that hire them. We announced our intention to work out regulations for the cash-for-gold trade to protect people victimized by theft. This follows incidents in which stolen gold has been quickly traded with operators, leaving victims without recourse to recover their losses, sometimes in the form of valued family treasures. This initiative aims to provide a safety net for consumers, support law enforcement and help businesses operate to the highest standards of accountability. n mid-week, on behalf of Bermuda, I signed an international agreement to protect the Sargasso Sea, the immense marine ecosystem that surrounds our Island. 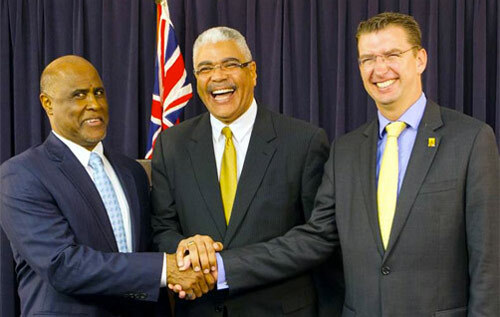 In signing the agreement with representatives of governments ranging from the United States, to Sweden and South Africa, we made sure that Bermuda maintained control and management authority over Bermuda’s Exclusive Economic Zone. Prior to the signing, we changed the draft agreement because it included our EEZ in the protective covenant. This would have taken away Bermuda’s right to explore our waters and what lies beneath them for potential economic benefits for Bermudians for generations to come. With the change made, I was very proud to sign the agreement that protected both our environment and our people’s right to earn a living from it. On Wednesday, I had the pleasure of attending a Bermuda Public Services Union conference, which was devoted to the subject of ‘Social Dialogue: A Catalyst to Economic Recovery and Growth’. This was a very positive gathering and touched on the need for collaboration that I have been preaching for some time. The conference underlined my belief that our progress together as Bermudians depends on us having meaningful conversations; that without positive social dialogue there is no future we can truly share. Last week’s labour disputes are an example of what I mean by meaningful conversations. I met with BIU leader Mr. Chris Furbert in the wake of the disputes, when there seemed to be no way forward. But when we took off the titles and sought to understand one another, it became clear there was ample room for progress. We subsequently announced our intentions to work together for solutions that work for the Island. Time will tell, but it is surely better to step forward together than not to step at all. My point here is that despite the noise of our politics, we are making steady progress to get Bermuda working again for everyone, no exceptions. We’re taking it one week at a time, working on the people’s business in all sorts of different ways.